Abacos, Bahamas Weather, what to expect. The north Bahamas climate, hurricanes and current conditions. Pictures and tracks of Hurricane Jeanne & Floyd. Including links and Webcams. In a sentence- The same as South Florida. The Bahamas are not in the Caribbean. They are in the Atlantic. The Abacos are 150 miles east of, and roughly parallel to the area from Palm Beach to Miami. They are in the northernmost part of the Bahama chain which stretches 600 miles in a southeasterly direction almost to Haiti and the Dominican Republic. (See map below). The weather in the Abacos with the exception of local patterns like the squall shown above, is pretty much the same as south Florida. The temperature is too. When it's 50 in February in Ft. Lauderdale, it will be close to that in the Abacos. Hurricanes hit the Abacos as often as they hit Florida. And for the early part of the millennium, that's been all too frequently. Often it is not unlikely for the same storm to hit both the Abacos and Florida. (See below) And believe it or not the last time it snowed in Miami, it snowed in the northern Bahamas. (January 19, 1977) No accumulation. THE WIND, will impact your boating activities. The Abacos are in the Northern trade wind belt being with winds often as strongs as 10-15 MPH during the winter. These being a result of the same winter cold fronts or Canada Clippers that pass all the way down to south Florida often proceeded by a squall line. They also effect temperatures in the Abacos dropping 15 - 20 degrees Fahrenheit during January and February. Although occasionally some stall before getting to the Northern Bahamas these aforementioned patterns are cyclical and pretty close to weekly. They are usually dissipated by May. Our favorite time of year weather-wise is mid May, through mid July, October and November. The latter baring any hurricanes of course. The table below says it all. Understand, mid spring starts the rainy season in the form of local thunderstorms and squalls and usually in the afternoon. They produce a lot of rain and some produce waterspouts so be on the lookout if you are on the water. Generally they are slow moving and can easily be out run in a small boat. There could be a downpour in Marsh Harbour while you are experience a sunny day on Elbow Cay or at Nippers and vise versa. In Summary: Again like Florida, in winter stay as long as possible to up your odds for part maybe all of your stay having fair weather. Minimally you'll need a sweater in the evening. As for Snorkeling, you might want to bring a wet suit top as the water gets pretty cool too. The winter of 2009-2010 was one of the coldest on record with temperatures often ranging between coldest ever and the below average low (in above chart). Often Intermittent & Sometimes Blurry - Abaco Webcams are here. 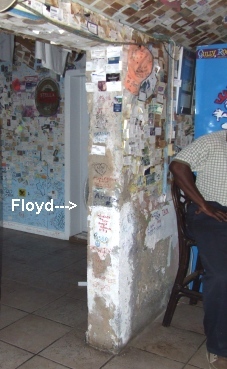 You can see the high water mark left by the tidal surge of Hurricane Floyd at Miss Emily's Blue Bee Bar on Green Turtle Cay. It's still there (2012) as in this early photo. This author moved to Florida in 1990. Our early years saw little Bahamian hurricane activity until 1999. That year the Abacos took a double hit, first with Dennis, a category 1 storm. It landed in late August. Then just two weeks later Floyd, a massive category 4 storm, clobbered the Abacos with a direct hit (above photo). The devastation was horrendous. It cut Elbow Cay in half. Then all was relatively quiet until 2004, when the Abacos got another double whammy. In an eerie replay, in early September, first came Frances, a category 1 storm. Then three weeks later, Category 3 Jeanne came along to finish what Frances left undone with another direct hit on Marsh Harbour and the Abacos' most populated Cays. Add to this an inordinate amount of rain accompanied the resultant flooding in around Marsh Harbour and again the bisection of Elbow Cay. And again just south of the Abaco Inn the Ocean opened up an inlet to White Sound. 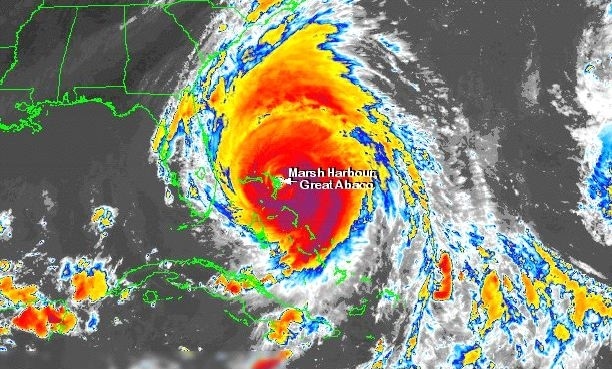 The above is hurricane Floyd in 99, it could also be Jeanne in 04, which when everybody thought she passed the Bahamas in mid Atlantic, did a loop, came around and headed back into Marsh Harbour. She continued on to eventually pass through Florida exiting just north of Sarasota into the Gulf of Mexico and skirted up Florida's west coast. Her counterclockwise winds pummeled my area of Sarasota. Jeanne's impact was our seasons worst (Sarasota) but no way near what she did in the Abacos nor what Charlie did to Southwest Florida a month earlier. Jeanne is the only storm that my west coast Florida hometown of Sarasota share in common with the Abacos. Despite the overwhelming destruction, messages started to trickle in by ham radio and posted on websites. Island folks were already clearing the debris and making life habitable to the best they could. It didn't take long for supplies to start arriving and within months many commercial establishments were up and running. And by March 05 most of the resorts were open. Importantly, to a lot of folks, so was Nippers! As happened with Floyd, the tourist industry seemed headed back to normal when we arrived the following season. On my visit in May of 05, we saw little destruction with the exception of the marinas and restaurants on the south side of Marsh Harbour which were totally destroyed and had not yet reopened. Building was underway. The exception to this was the Conch Inn. It was completely rebuilt first in order to facilitate the dozens and dozens of bare boat charter boats they accommodate and the support services they require. The only other devastation we saw was up at Green Turtle Cay. The Bluff house docks were just about rebuilt after being totally wiped out. That despite being built of non floating hardwood used negate the effect of a tidal surge. The Green Turtle Club suffered little dock damage. But it goes without saying anybody anywhere in the Abacos close to the water received 2-3 feet of water in their home. Even the inland Marsh Harbour Airport sat under 1 to 2 feet of water till things dried out. Mention the 2005 hurricane season and Katrina comes to mind. Yet that year saw some irony from the Abaconian perspective. Although devastating in the US, several of the storms were born in the lower Bahamas (Katrina, Ophelia & Rita) then two headed west for Florida while growing in destructive power along the way. Their effects had little impact on the Abacos especially compared to the hurricane activity of 2004. Understand, the Bahamas are spread out over approximately 600 miles. Storms effecting one island group can have minimal impact on others. It's the luck of the draw as to whether it be the Abacos or the Exumas who get hit. In 1992 Hurricane Andrew devastated North Eleuthera with winds of 150 MPH while Hope Town on Elbow Cay Abaco, 75 miles to the north had a minimum of ill effects. "According to the experts" their early seasonal predictions are more often than not, wrong, and usually hyped by the previous season. The point being, we can figure out where they are headed once they start, but to predict the impact and number of storms eight months in advance, it still seems like guess work to me. 2012 had only one hurricane impact on Abaco and the US and that, I need not remind you, was Hurricane / Super Storm, Sandy. Yes it passed over Abaco doing little damage as a hurricane #1.  When it arrived the arm pit of New Jersey and New York, that was another story of which there are a hundred websites. The following summary says it all. It's part of a story I wrote for my boatclub's newsletter after returning to the states after Floyd in '99. As I found out in subsequent years the same rings true . ............We were looking for the telltale signs of Hurricane Floyd which we saw right away upon landing, Snapped pine trees lined the runway. Once in our taxi and underway to Marsh Harbour, we noticed the rebuilding everywhere. Surprisingly, just about all the commercial places, marinas, restaurants and resorts were repaired and many were substantially improved over last year, all be it that two of the major resort hotels on Elbow Cay changed hands. This is not to say we didn't see a few docks up routed here and there and an occasional boat up on the rocks. But all in all we estimated an 75% recovery in just 7 months! Aid came in the form of insurance money and the suspension of the 25%- 50% duty for construction materials machinery and equipment (Abacos only). Also, the forgoing of work permits for the Americans that came over to help with the cleanup. The spot where Elbow Cay was cut into two was already filled in. Imagine that happening state side with all our environmental & bureaucratic red tape. But what impressed us the most was the energy and effort of the island folks in the repair of their Abaconian homeland.